In part 2 of this three article series, we discussed the “innovator’s dilemma” to better understand the challenges that the digitalization of business imposes on both established corporations and start-up ventures. We also explored strategies established firms can employ to successfully master digital transformation. In this third and final part, let’s consider eight game plans that start-up ventures may employ to drive digital transformation. As we discussed in part 2, start-up entrepreneurs are excellent at recognizing opportunities for digital niche products that make meaning, typically either by righting a wrong or by amplifying the quality of people’s lives. Due to their tech background, most digital products are increasingly complex. Hence, as a digital start-up, begin small by focusing on a simple niche product. Make the basics of this niche application awesome first. Then, at a later stage, add more functionalities and other products. When considering their customers’ journey, established corporations tend to adopt an inside-out perspective: They think along their internal sales funnel or conversion cycle (e.g., awareness, consideration, test and comparison, purchase, after sales, loyalty, advocacy) rather than putting themselves into their customers’ shoes. As a start-up, do the opposite. 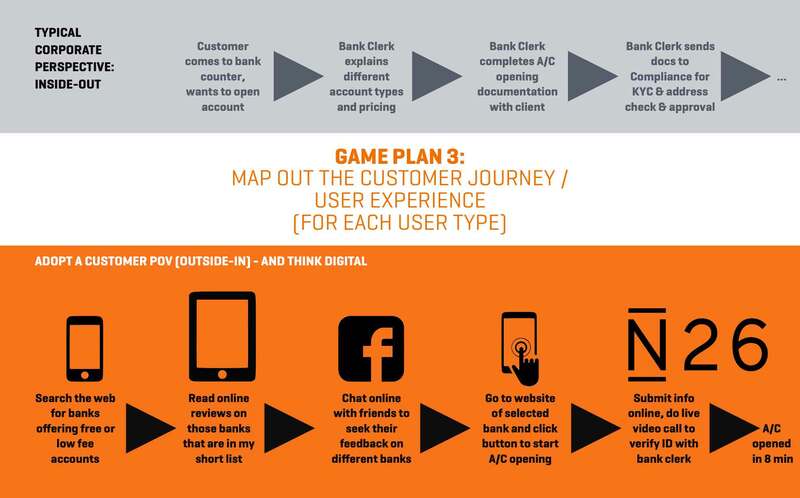 Adopt your customers’ viewpoints from the outside-in, and map out the digital customer journey. For example, a young customer interested in opening a bank account searches the web for banks offering accounts either for free or at a low monthly fee. Then, she reads online reviews the banks she has shortlisted. Next, she may chat online with friends to seek their views on different banks. Once she’s settled on her favorite, she consults the website of the selected bank; ideally, it has a button that she can click to begin the account opening process online. She submits all required personal information. Then, a bank clerk initiates a video call to verify her ID documentation online. By mapping out the customer experience in a similar way, new N26 customers are able to open a bank account anywhere in the world in around 8 minutes only and without that they have to physically visit a bank branch. As we discussed in part 2, disruptive product technologies are simpler, more convenient, more reliable and cheaper than existing alternatives. 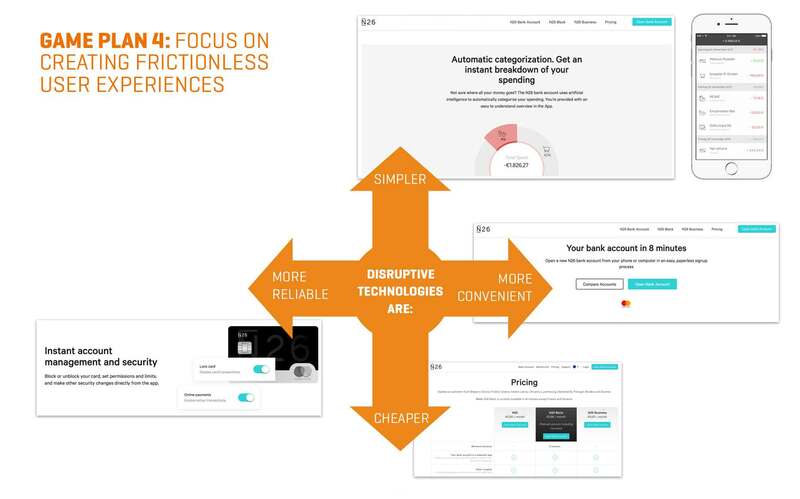 So, when designing your digital user experience with your start-up, look for ways to remove all these frictions that typically impede many traditional analog user experiences. For example, N26 automatically classifies customers’ purchases paid with their credit card into different categories such as “groceries”, “bars & restaurants”, “travel & holidays” (simplification); it facilities opening new accounts from home in about 8 minutes (increased convenience); it offers instant adjustment of account limits and security settings with the shift of a screen buttons (higher reliability); and its basic account and card comes for free (price reduction). As a start-up venture, apply rapid prototyping while creating a new digital value proposition. Soft-launch a beta-version early and invite test users to tell you “what’s wrong with it.” Then, apply all useful suggestions in an updated version, and through a series of iterations, arrive at a minimum viable digital product that you can fully launch. As such, plan to fail earlier to succeed sooner and be faster and better than incumbents. For example, Airbnb created a platform to connect renters (travelers looking for affordable accommodation) with hosts (locals interested to rent out their property to visitors). Similarly, Uber’s platform allows freelance drivers to connect to riders interested in a cheaper, yet more convenient transportation alternative to a taxi. Paypal allows even three parties to process payments over its platform: account holders, merchants, and banks. With our new TIPS innovator profiling test platform that we’re currently building, Thinkergy will also enable individual users, coaches & trainers, and HR & Innovation Departments to independently purchase and allocate online test coupons without our direct involvement. Next year, the number of mobile phone users in the world is expected to pass the five billion mark, meaning that two in three persons will own a mobile phone. So, when you create digital value propositions, preferably design it for use on a mobile phone, or at least ensure that the user experience is as good on a mobile phone as on any other electronic device. N26 didn’t just create a disruptive digital bank account. They intentionally choose to focus on the mobile phone as the device of choice for client interactions. In the 20th century, industrial corporations mass-produced products to realize economies of scale. Then, they persuaded consumers to purchase those products using mass broadcast marketing strategies. 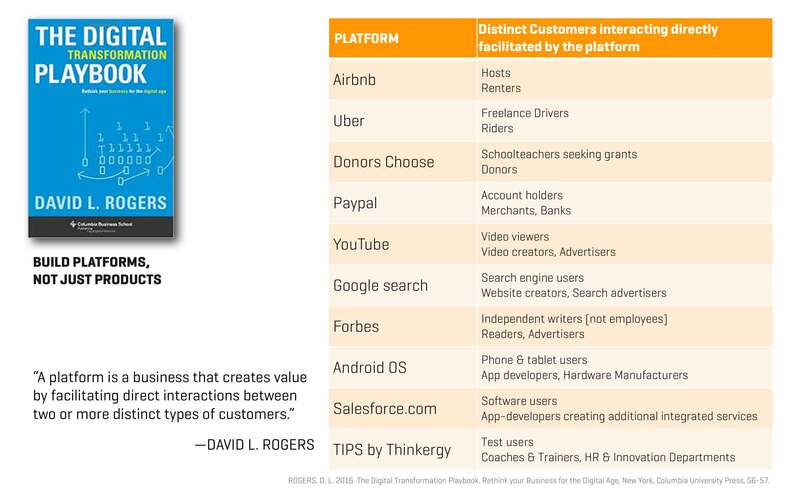 In his Digital Playbook, David Rogers introduces a new model to drive purchasing decisions in the 21st century. 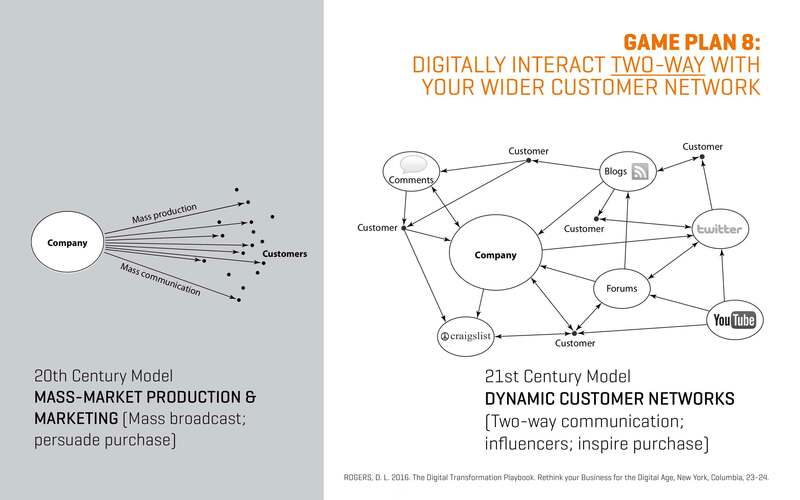 Dynamic customer networks are characterized by two-way communications between companies, consumers and influencers to inspire purchases; thereby, many of these communications will take place digitally involving social media (e.g., Twitter, Facebook, YouTube, Instagram), e-sales platforms (such as Amazon, eBay, Craigslist), online forums, and blogs, among others. The shift to this new model also means that digital advertising will continue to rise in importance. By 2020, media experts expect that half of all advertising will be spent online, and will equal all offline advertising spend. The more I read and think about digitalization, the more I believe he’s right. Do you lead, manage or work in an established organization or a start-up? How will the digital wave affect your business? How do you plan to master the challenges of digital transformation with your business? Contact us if you want us to help you with our innovation expertise. 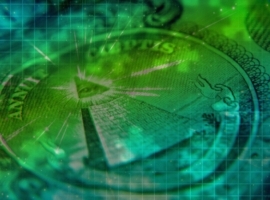 Next article What consciousness level do you operate on?